Product #26824 | SKU MP06638 | 0.0 (no ratings yet) Thanks for your rating! 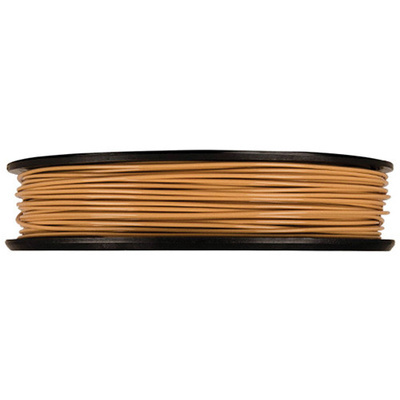 The 1.75mm light brown PLA Filament (Large Spool) from MakerBot is a bioplastic derived from corn. It's guaranteed not to have any heavy metals, phthalates, or BPA (Bisphenol A). The large spool provides 2 lbs (0.9kg) of PLA plastic filament. The MakerBot PLA Filament is comprehensively quality tested at both 100-micron and 200-micron layer resolutions on the MakerBot Replicator 2 to verify that the filament will perform every feature that the MakerBot MakerWare software offers and will reliably slice and print every type of 3D printing available. If you're new to 3D printing, the MakerBot PLA Filament is a good material to start with. The MakerBot PLA Filament also adheres well to acrylic and to blue painter's tape. Prints with a large bottom may have a tendency to curl. To prevent curling, use rafts. To ensure high filament quality and performance, store the MakerBot PLA Filament in a cool, dry place when not in use. This is because the MakerBot PLA Filament will absorb moisture from the air if exposed to humidity for long periods of time. Also, your build-plate must be level, clean, and oil-free to ensure the highest quality 3D printing. It is also recommended that you use the MakerBot PLA Filament and your MakerBot 3D Printer in a well-ventilated area.